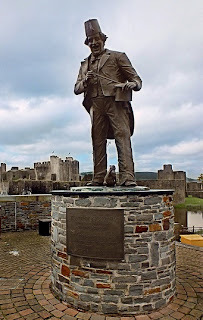 The recent article I did on Tommy Cooper got me wondering about what other magicians might have statues. So far what I have found is pretty bleak. My criteria for this is for outdoor life-size or larger than life statues. I am not including busts, as there are a number of these around and I plan to cover those in another upcoming article. First up we have The Masters of the Impossible, Siegfried & Roy. 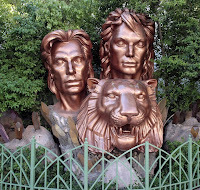 Their massive bronze statue is outside the The Mirage Casino Hotel in Las Vegas. I believe it was erected in 1993 but I don't know who the artist was who created the work. I also am not sure it's actually a bronze statue or just a fiberglass statue with a bronze finish. I hope it's actually bronze. Sadly, S&R have been off the strip so long and some only remember them for the accident. But at their peak they were wonderful performers and entertainment icons. I hope their statue remains for many many years to come. In front of the Maison de la Magie in Blois France is this wonderful statue dedicated to The Father of Modern Magic, Jean Eugene Robert Houdin. He certainly deserves a statue and I'm glad to see that one was erected in his honor. However, I do not know the cost of the statue nor who sculpted it. The museum behind the statue is said to be the 'house' of Robert Houdin, but I'm not sure that is the case. I don't recall the Houdin house being that large. 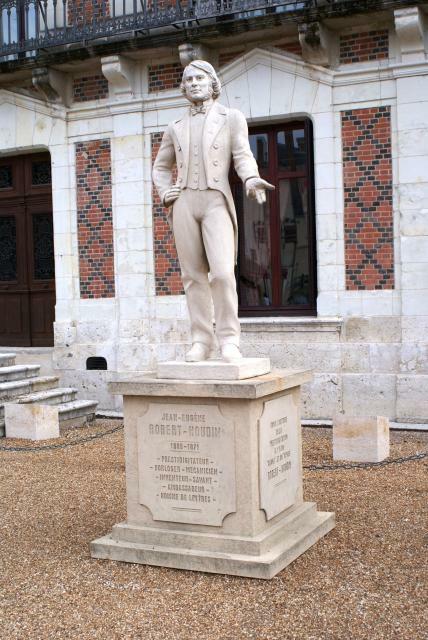 One thing is certain, the descendants of Robert-Houdin did donate the house to the town of Blois to be used as a museum to the great French Magician. Tommy Cooper, the fez wearing British comedy magician has a statue in his honor that stands in his home town of Caerphilly, Wales. Tommy Cooper died while doing a show LIVE on TV in 1984. Like all the performers in this article, he transcended the magic world and was considered an entertainer for the masses. His statue is made of bronze and stands 9ft tall. It was created by sculptor James Done at a cost of £45,000 which was raised by The Tommy Cooper Society in 2008. Harry Collins was a magician and spokesman for the Frito Lay Corp. He was also one of the first magicians to inspire Lance Burton and I believe he was also Lance's first magic mentor. 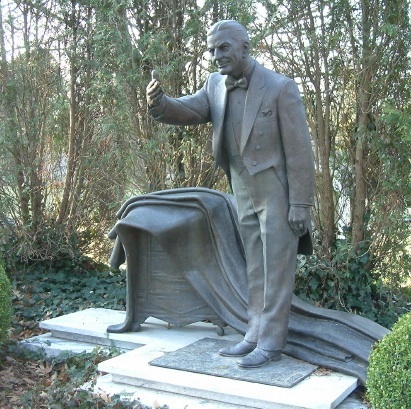 The statue stands over Harry Collins grave in the Cave Hill Cemetery in Louisville, Kentucky. The statue appears to be a bronze casting and no idea who the artist was or the cost. 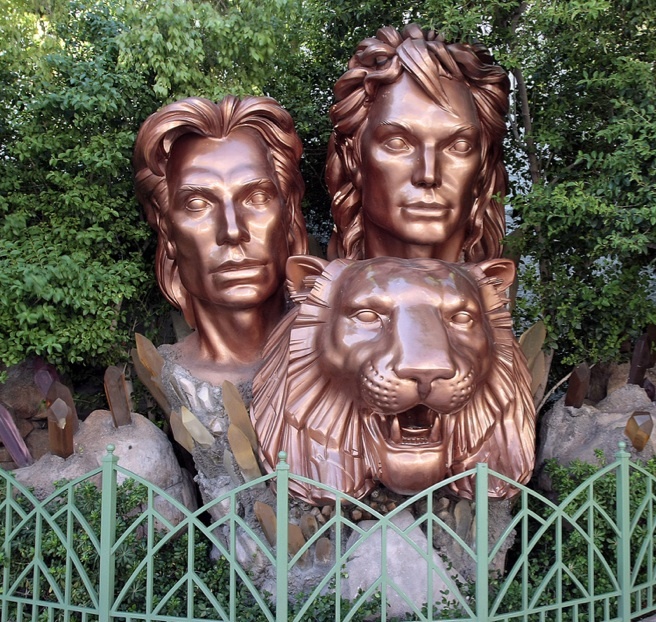 The latest edition to the statues is one that was recently unveiled in August 2012 at the MGM Grand Hotel in Las Vegas. This bronze statue is dedicated to the 'King of Magic' David Copperfield. This is the most unusual statue of the group because at first glance it might appear to be a giant bust of the magician. However, the lower part of the statue features sculpted images from some of David's most popular illusions, including Flying, Walking Through The Great Wall of China, Making the Statue of Liberty Vanish, The Lear Jet Vanish and Tornado of Fire. It sits in front of the the theater where David Copperfield regularly performs in Las Vegas. The big question I have is, "Where is the Statue of Houdini?" The sad answer to that is, there is NO statue of Houdini. The closest thing we have is his grave with the bust, but by the criteria I set above, that isn't quite enough. Let's face it Houdini deserves a life size statue! I know at one time the SAM led a concerted effort to the get a Houdini Postage Stamp which eventually paid off. Perhaps it's time to work on the creation of a Houdini statue. There actually is/was a statue dedicated to the memory of Houdini, but it was of his Metamorphosis Trick which at one time was on display in Appleton Wisconsin. That statue is currently in storage while the city finds a new place to display it. IF you happen to know of a magician statue that I missed, please let me know. I'm looking for more statues, NOT busts. I have a list of magic related busts that I'll be doing soon. Great post. Yeah, where is the Houdini statue? THANK YOU for this, what a fascinating image! But maybe we must go MGM Grand Hotel? Who can give me a good advise?